No 4th of July decorations are complete without the patriotic full fans! Red, White, and Blue Stars & Stripes Full Fan has five stripes (red, white, blue, white, red). Bold white stars are placed in the center blue stripe. 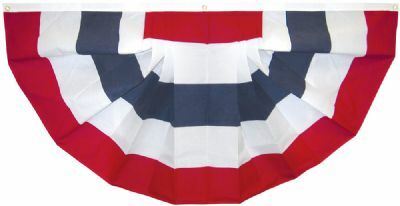 This pre-pleated fan comes with canvas heading and grommets for easy hanging.